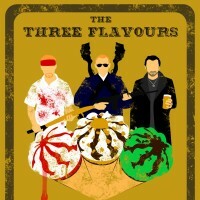 The Three Flavours Cornetto Trilogy is a series of British comedic genre films directed by Edgar Wright, written by Wright and Simon Pegg, produced by Nira Park, and starring Pegg and Nick Frost. This marathon session showcases all three films in one genre endurance test. each of the three flavors of Cornetto will be on offer. We'll also be celebrating the 10th Anniversary of HOT FUZZ, the second entry into the trilogy. We'll also have some exclusive BABY DRIVER merchandise packs thanks to Sony Pictures to give away to celebrate the release of Edgar's new film.